So yesterday was an exciting day if you're a Doctor Who fan like me but I've had something even bigger to look forward to today. The launch of my piCture pOlish collaboration shade! So be warned this post is going to be long and picture intense. I have had to keep this secret for so long. 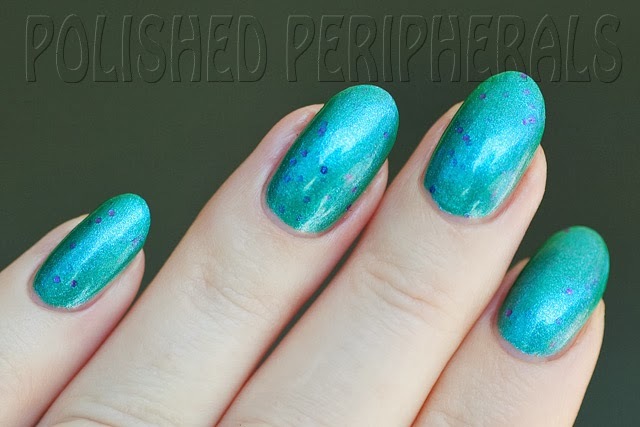 Way back in 2012 I was one of the lucky bloggers who received two piCture pOlish shades to swatch and review for Blogfest 2012 (here and 2013 here). Even luckier I was then selected as one of the bloggers to work with piCture pOlish to produce a shade of my own, my dream colour with my name on it! Now coming up with my dream colour was interesting. I love green but Cathy from More Nail Polish had already beaten me to the perfect green with piCture pOlish Kryptonite. The other thing I love is lavender. I love the plant, the scent, the colour and it's my surname. It's a tradition in our family for the women to carry on the Lavender name. When I was 12 my great uncle came to visit from England and researched the Australian connections to the Lavender family. 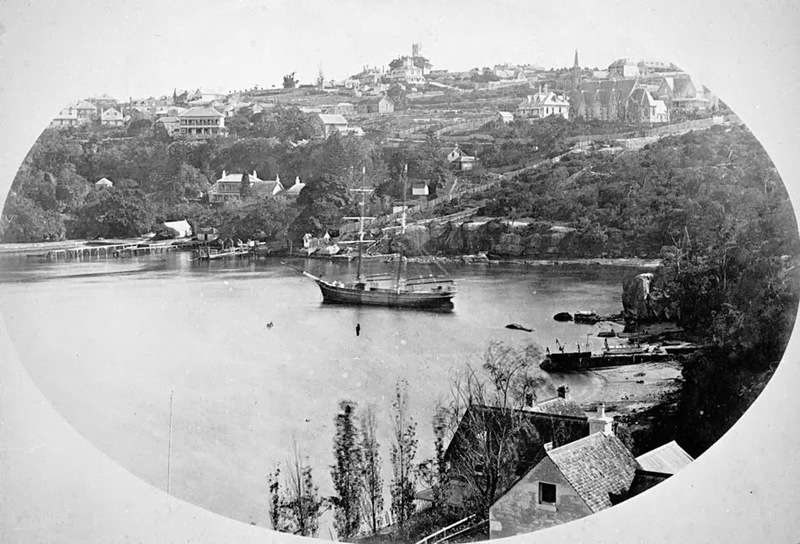 Lavender Bay in Sydney is named after an ancestor, George Lavender who was a boatswain on the Charlotte in the first fleet and later boatswain of the convict hulk Phoenix which was moored in the bay. My great uncle showed me the family tree and in short I learned about my family and officially changed my surname to Lavender-Roberts to keep the name going. 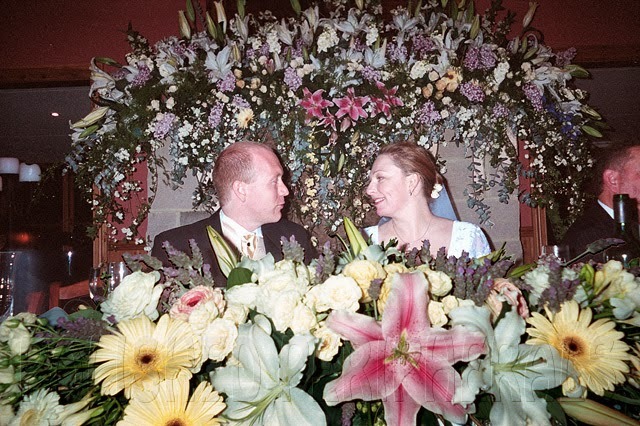 When I got married I kept the name and we had a floral theme for our wedding with lots of lavender. 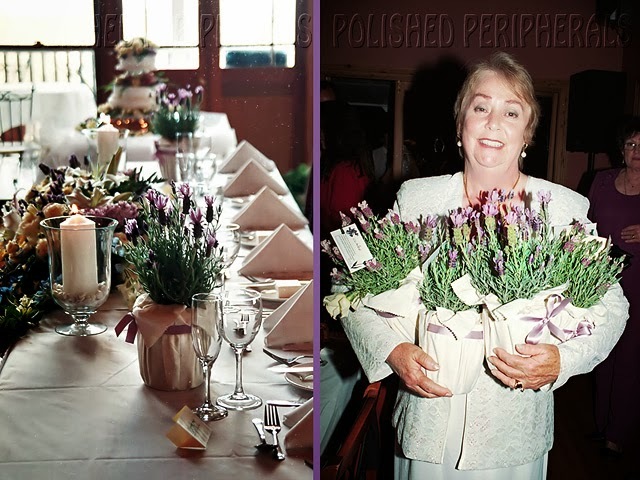 We had dried lavender sprinkled on the tables, lavender in my bouquet and decorating the cake, all the ladies got lavender plants as a gift and the scent in the reception hall was amazing. That beautiful lady is my Mom, with some spare lavender plants. My father was very proud to explain during his speech that I would be keeping my name and continuing the tradition. 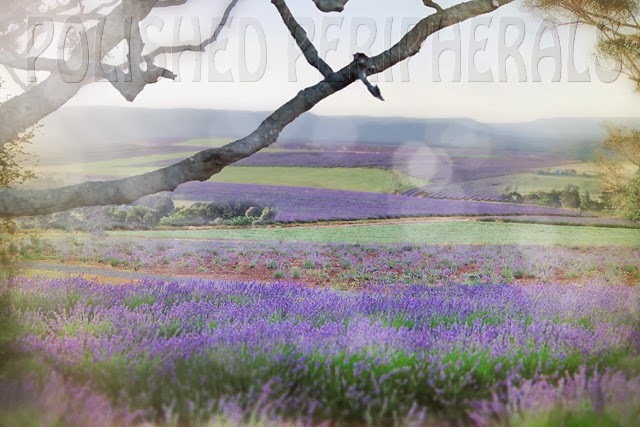 For our honeymoon we visited a lavender farm and when I close my eyes and relax that's where I go. 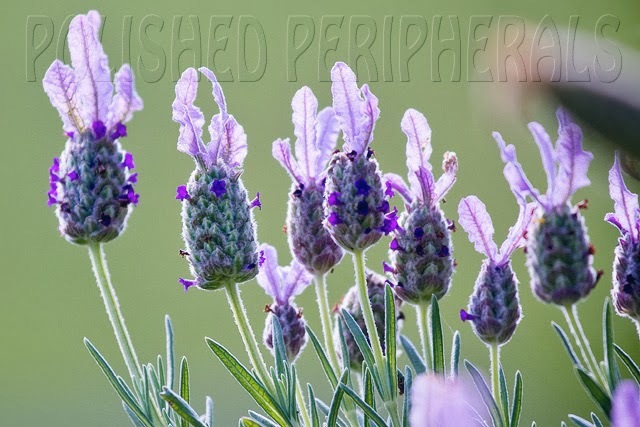 I picture fields of lavender. 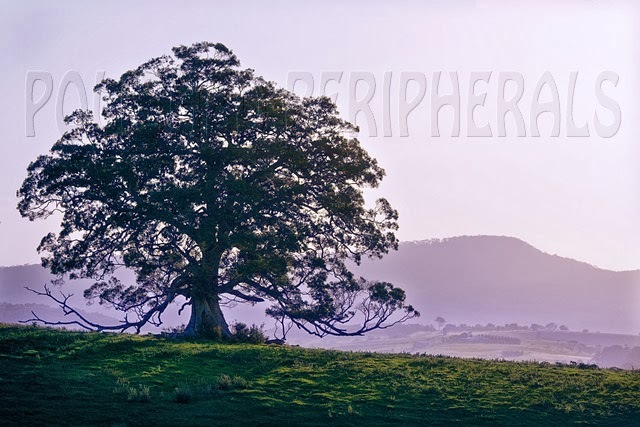 A seat in the shade of a tree at the top of a gentle hill, overlooking a field of lavender, with a haze of shimmery purple above the blue green foliage. This is actually a tree I met on a farm holiday. The sun is warm but it's cool in the shade. I can hear the ice in my glass cracking and there's a slight breeze bringing with it the scent of lavender and the sound of bees. 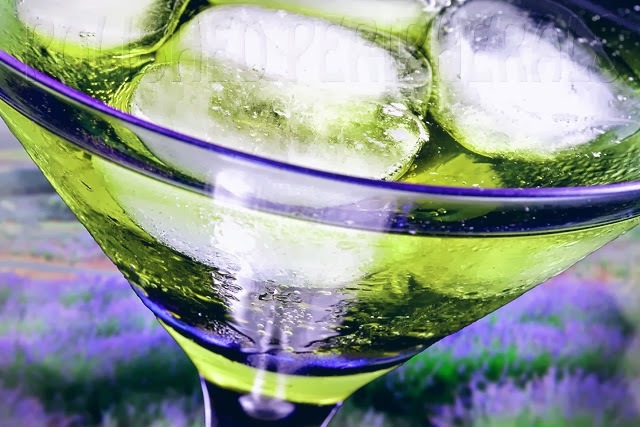 This was a cool drink, you can tell right? 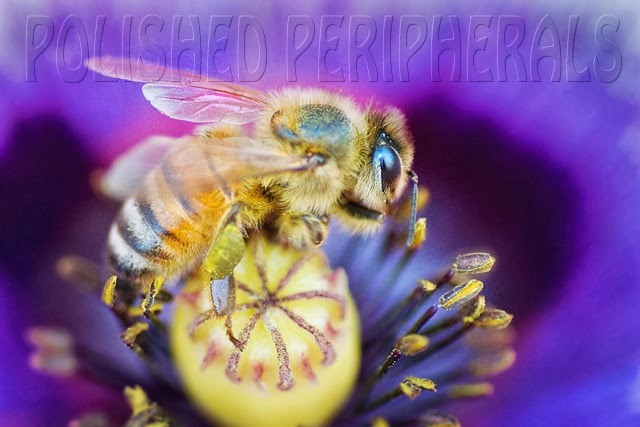 There were so many bees around when I took this photo, the noise was incredible! I have nothing I need to do right now, nowhere else I have to be and no one to answer to (and my nails look amazing). 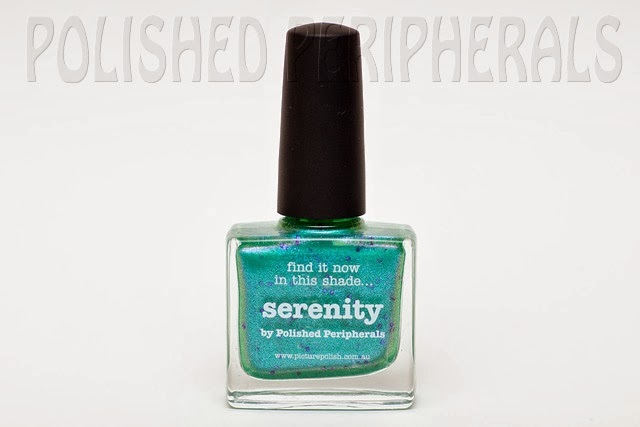 Relax, enjoy, this is my serenity, piCture pOlish Serenity! Serenity takes me to a peaceful place :) I could stare at this colour all day. When I look at it I can take a deep breath and drift away. 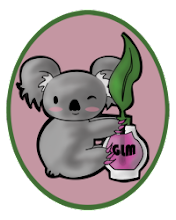 Strangely enough I get images of gum trees and tropical waters as well as fields of lavender so that's a bonus. Serenity is a shimmery blue green with a subtle lavender haze and just enough purple glitter to enhance the lavender without dominating. It's one of those polishes that changes with every angle. In some lights (like flash) it looks like a turquoise foil and in other light it becomes a grey geen. The lavender haze is more obvious with indirect light and impossible to photograph. I've taken lots of photos to try and show all the colour changes. I've worn this a lot since I got the sample bottle. Mostly it's a two coater but if you don't let it dry enough between coats it can drag so I have three coats in some shots because I hurried my painting. Like other piCture pOlishes I've worn it goes on smooth and even, and I've worn this for a week at a time without chipping (with base and top coat). There's no sign of staining and it comes off as easily as any polish without glitter. 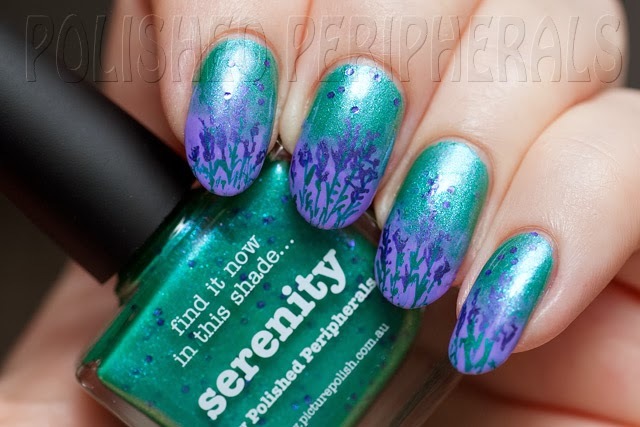 When I first saw Serenity I knew I'd have to try it with piCture pOlish Wisteria. I used piCture pOlish Violet Femme for the lines. I wasn't happy with my line work so I tried painting some lavender next. I wanted to stamp some lavender but the closest match I could find to a bunch of lavender was some Thanksgiving wheat and the design was too small for my nails. So I had to paint my flowers by hand, roughly. I hope you'll love Serenity as much as I do and a special thanks to the girls at piCture pOlish for making my dream come true. piCture pOlish Serenity can be purchased directly from https://www.picturepolish.com.au or through their international network. Check out piCture pOlish's facebook page for news and updates. A beautiful story to accompany a beautiful polish. Well done mate! Such a beautiful shade. I'm so glad you got a collaboration shade. 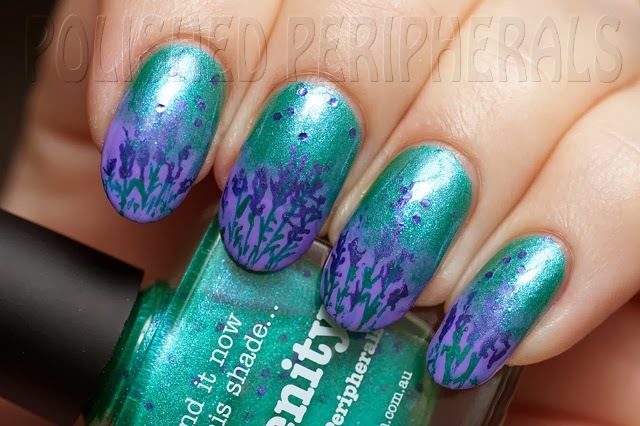 I remember your post last year and I really believed you would get one with your amazing mani featuring Kryptonite! Beautiful inspiration. I love this polish and can't wait to get my hands on it. This is beautiful Rebecca! I love the story behind it, and the lavender wedding favour idea is wonderful!